Text messaging has been a significant way of communication ever since the smartphone became popular. However, sometimes some annoying issues may occur which we should pay attention to today. Here’s the thing. In various forums, we can see many complaints like these, “my Samsung phone won’t receive text messages”, “my Galaxy S7 won’t send texts” and many others. 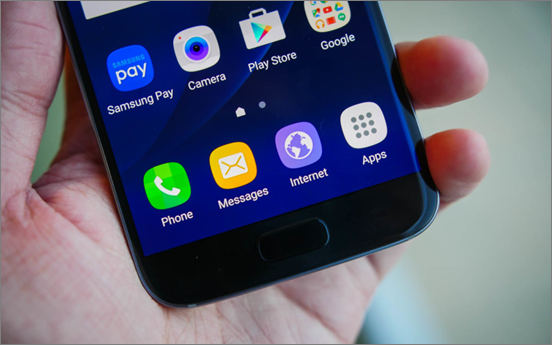 Numerous Samsung users are reporting that some or all messages people have sent to them aren’t being received. No warning is sent, and leaving users oblivious. Whatever, the good news is that this Samsung Galaxy texting problem can be solved with some tricks. So if your Samsung message app is not working, you don’t have to repair or replace your phone and you just need to fix it with the solutions below. Problem: Samsung galaxy not receiving text messages. You can send messages to people, but your Samsung Galaxy phone is not able to get text messages from anyone. Even you try restoring factory reset, forcing app to stop and rebooting the phone, nothing is working. If factory reset can’t solve it, that’s to say that the problem might not be cased by your phone. Then please try to remove the SIM card from the phone, insert it into another one and check whether the same problem occurs or not. If it reoccurs, then it should be a SIM problem. So you will need to contact your carrier to settle it. Problem: Samsung not receiving text messages from one person. You are unable to receive text messages from a specific number, but they can receive messages from you. Usually, when this happens, you should check if this number is blocked by your phone and lies in your Spam List. Go to check it by performing the steps listed below. Go into your Messages app, and tap the “More” button and then tap on “Settings”. Select Blocked Messages to view the messages that have been blocked. Tap on Block List. Here you can remove the number from the list. Problem: Samsung not receiving long text messages. You can receive every messages from anyone, except the very long messages regardless sent from an Android or an iPhone. 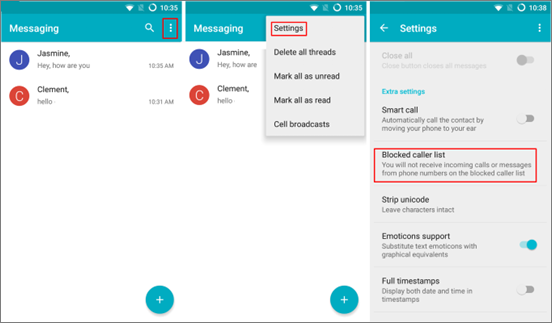 If you are using Textra as the default messaging app on the Samsung phone, when the above problem happens, you should go to the Settings and turn off Advanced Messaging on your Galaxy phone. After that, go back to Textra and you can see all your messages again – both long and short messages. Problem: Samsung messages not sending. If you are only unable to send messages to a certain contact, it’s likely that the problem is caused by your carrier. But if you can’t text to any contacts, it’s difficult to distinguish who is the culprit. However, you can still take the following steps to get rid of the issue. Those are the measures you should take: 1) rebooting your Samsung phone, 2) clear cache data, and 3) reset your phone to factory reset. Problem: “Unfortunately, Messages has stopped”. Every time, you run the messaging app it just crashes and shows you this frustrating error message. This error message is telling you that the phone messaging app is crashing for some reasons. If your have recently updated your phone system, it may be a firmware issue. Then you should try 1) rebooting the phone into safe mode, 2) clearing the cache data and system caches, and 3) do the reset. Problem: Samsung Galaxy text notification not working. You can send and receive texts but text notification is not working on Galaxy S Series or Note Series, so you have to randomly look down at your Samsung to see if there comes a new message. Make sure messages notification is on, check this by navigating to Settings > Notifications. And also try changing the text notification sound, because the current on may have a problem. If this issue still exists, 1) reboot your phone into Safe Mode, 2) find out and uninstall the app that may cause this issue, and 3) do a factory reset on your phone. Problem: Failed to download multimedia messages on Samsung S/Note. When you receive text messages and it is still downloading after a long time. To avoid the problem that Samsung won’t send or download MMS, you should make sure your phone has an active mobile data connection. Check this by going to Settings > More networks > Mobile networks > turn on the mobile data option. If it’s already switched on, check the APN settings which should match the settings being used by your network. Problem: Some of your text messages disappeared for some reasons. For example, you accidentally deleted your messages from Samsung Galaxy S9/S8/S7/S6, etc. Actually, when messages are deleted, they only turns to be invisible, and then disappear completely when being overwritten. To retrieve deleted messages from Samsung phones, you don’t need to look farther than Samsung Data Recovery. It’s a professional data recovery software with high recovery rate. It can recover SMS messages and other Android data from a lot of scenarios like System crash, accidental deletion, factory reset and others. If you own a Samsung Galaxy phone or any other Android device and have the same matter we mentioned above, then please feel free to comment below and share your solutions. We will be more than glad to assist you with any issue that you may have with your device. iPhone/iPad Keeps Restarting? Here’s the Fix!